Two perhaps questionable moves by Tan Jee Say in his early efforts to gather public support for his next run for office -- one is to rely on the widely circulated but maybe questionable research findings of a relatively new professor (Thum Ping Tjin). The other is to parrot what this fresh researcher wrote and said without due diligence of his own, like cross-checking with other historians and sources. Third, the above British declassified documents show that it is a big folly to read the MI5 report in isolation. 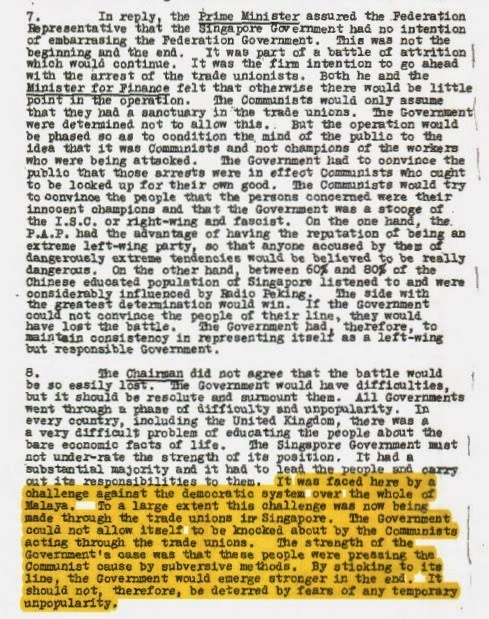 Thum Ping Tjin and then Tan Jee Say have brandished the MI5 report without realizing that it should be read in the context of active and robust discussions about the extent of the communist threat. Thum is seized by the MI5 report without considering its context and taking into consideration the totality of evidence. I do hope that Tan Jee Say will reconsider his position, because as a opposition politician and he shouldn't bet so many eggs in this basket. Fourth, what Thum (and Tan) fail to realize is that the MI5 report by the British SLO Maurice Williams was not the norm, and it is a gross error of judgment for a historian, even if new, to rely heavily on such a report to make momentous conclusions. Revelations from many sources, including CPM sources, confirmed without a shadow of a doubt, the existence of a communist conspiracy and the communist united front. CPM chief Chin Peng and the Plen had revealed in their books about sabotaging PAP’s plans for merger and Malaysia. The Plen had revealed how he had used the Chinese press to disseminate his opposing views. He also revealed how he had had secret meetings in Jakarta to lead the united front in Singapore and target the PAP for subversion, how he had ordered a top CPM cadre in the Workers Party to resign, and how he had ordered all support for Partai Rakyat to be withdrawn during the 1959 General Election. 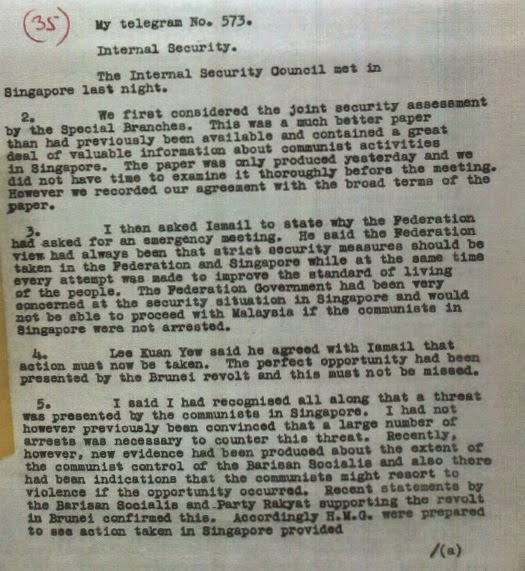 Chin Peng in turn had disclosed how Deng Xiaoping had ‘advised’ him in July 1961 in Beijing to continue with the armed struggle and how he accepted the ‘advice’ and Deng’s offer of financial help. 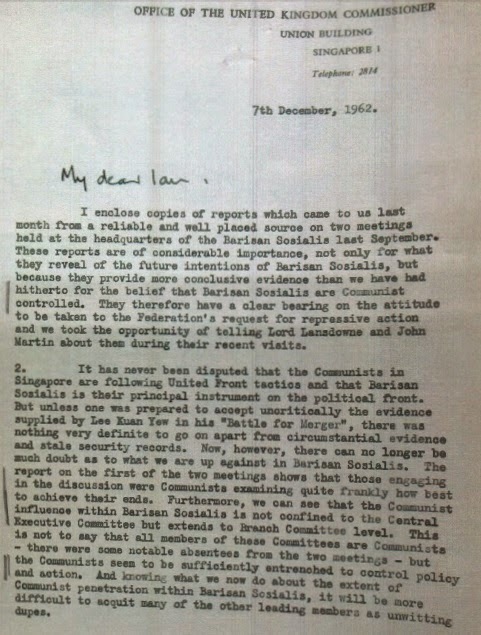 These are just some facts that clearly contradict the claims by Thum, Tan and others that there was “no evidence” of a communist conspiracy. Bottomline for all interested readers is this -- we should read new interpretations of history with a curious mind and not take everything at face value. 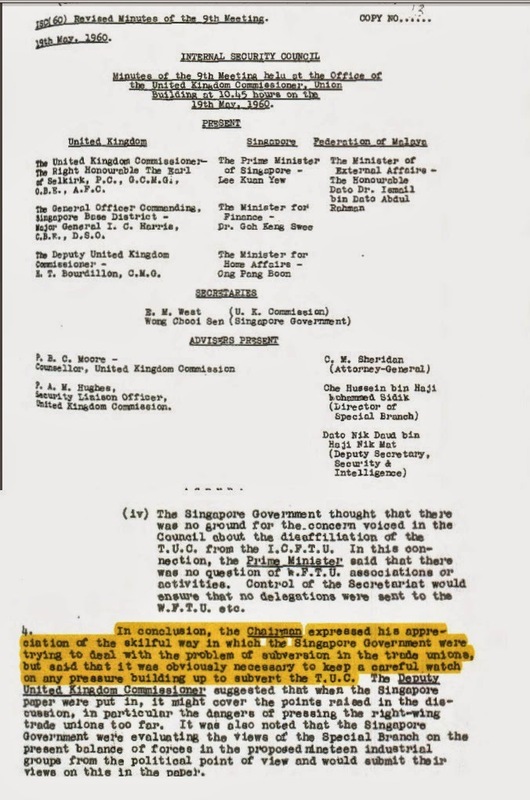 As a Singaporean who has been a long time working resident of London, I will say that the British public is also somewhat skeptical of the British archives because one might never know if ALL documents were declassified or if officials writing the reports have other motivations. Nevertheless, Singaporeans should never forget our own history because if we do, then Singapore would really become just a place for people to make money! People read what they want to read. Lim Chin Siong was never a communist...? All hail the reprint of Battle for Merger?